Long-time Honduran activist Edwin Espinal has been jailed on charges related to protests against election fraud in Honduras. Due to his activism, he has been subject to State harassment, violence, and threats since the 2009 coup d’état. Immediate action is required to push for Edwin’s release and to ensure his safety. Edwin is currently in pretrial detention. At the end of his initial hearing inside military facilities on January 22, the judge ordered pre-trial detention and sent Edwin to La Tolva, a high-security, U.S.-style prison. The prison has extremely restricted visitor access, is run by a military Coronel, and prisoners are only allowed one-hour of sunlight every two weeks amongst other horrific conditions. Although the case has been appealed by local Honduran human rights organization COFADEH, Edwin could remain in detention for two or more years waiting trial. In 2010, Edwin was abducted and tortured by Honduran police, who were later acquitted – in the corrupted legal system – on all charges for their abuses. Edwin has been interviewed by Democracy Now!, Al Jazeera’s Fault Lines and in the documentary Resistencia: The Fight for the Aguan Valley. His story has also been featured in articles published by Truthout and POLITICO Magazine. The legal proceedings against Edwin have completely violated Honduran law and due process. The case is being heard in “national jurisdiction” courts that, according to the charges against Edwin, have no jurisdiction over the case. The judge presiding over the case is the same judge that ordered the raid on Edwin’s house in 2013, which, according to Honduran law, is illegal. Edwin’s legal representatives were given one day (a Sunday) to prepare his defense and he was later sent to prison to await trial, which could take years. § That Edwin be transferred to a detention center as determined by COFADEH (the Committee of Relatives of the Detained-Disappeared in Honduras), which has provided long-term legal and human rights support for him since 2009. Edwin is currently being held in a jail run by a military officer, and the facility has extremely restricted access for visits by family, friends, and human rights groups. These visits are crucial to help guarantee his safety and well-being while detained. To date, his family and his lawyers have not been able to visit him. § That Edwin’s case be transferred out of the “national jurisdiction” courts and into the regular court system. § We urge human rights delegations, journalists, and investigators to visit Edwin and other arbitrarily detained political prisoners experiencing repression in the context of the post-electoral crisis and the imposition of the Juan Orlando Hernandez regime. § Financial support for Edwin’s family is needed as they seek justice and work to ensure his safety and demand his release. § Contact the US, Canadian and Honduran representatives. See list below for contacts and demands. § Immediately drop the trumped up charges against Edwin and other political prisoners. Grant the appeal for Edwin’s case which would overturn the January 22 court decision which sent Edwin to prison to await trial. § Transfer Edwin to a detention center as determined by COFADEH. § Transfer Edwin’s case out of the “national jurisdiction” courts and into the regular court system. § To immediately address the issue of the political prisoners and pressure the Honduran authorities to drop all charges against Edwin and release all political prisoners immediately. § Insist to Honduran authorities that Edwin be transferred to a detention center as determined by COFADEH & that Edwin’s case be taken out of the “national jurisdiction” courts and heard by the regular Honduran court system. § Of US Congress members: to sign onto the Berta Caceres Act demanding suspension of US military aid to Honduras. On December 22, 2017 the US State Department congratulated Juan Orlando Hernandez on his electoral victory. This video in Spanish and English is our response. The written document in English is HERE. June 2017 Week of Action in Solidarity with Honduras! 8 Year Anniversary of the Jun 2009 coup in Honduras and one year since the assassination of Berta Cáceres. Honduras Solidarity Network is uniting with our member organization Witness for Peace and other organizations for Week of Action for the Berta Cáceres Human Rights in Honduras Act! To support the Berta Cáceres Human Rights in Honduras Act, HR 1299. 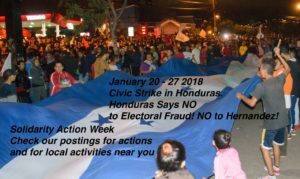 Kick off the Week of Action by joining a webinar coordinated by the Honduras Solidarity Network: register for the webinar here. Consider hosting a viewing party in your community! Join Berta’s family in calling for the Berta Cáceres Act. Learn more about Berta’s life and legacy, the broader human rights crisis in Honduras, and the connections to US-funded militarization and ongoing security aid. Write to your Member of Congress and help us circulate a video about Berta and the importance of the bill on social media. video here This Monday we’ll be circulating/sharing it widely on social media, including sharing it on Reps pages and our own, as the first day of Congressional action. Engage communities that are important to you, to help build awareness about the ongoing violence in Honduras and ensure their support for the Berta Cáceres Act. Organize your faith community, labor union, or other community organization to endorse the bill. On the anniversary of the 2009 coup d’etat, join us in amplifying the voices of Hondurans calling for justice for Berta and demanding an end of military support for the Honduran state. Participate in our social media campaigns to publicly contact your Representative, and help Honduran organizations share their calls for justice. Join our friends at the Sierra Club in exploring the details of Berta’s assassination and honoring her life as an environmentalist, feminist, and visionary leader. Help us circulate their recent article about Berta’s life, assassination, and trial by sharing on social media and sending to your Representative. We’ll be sending more information about the specific focus of each day of the Week of Action, and the Witness for Peace webpage for the Berta Cáceres Act will have information about each day’s focus. Thank you for your advocacy! For 2016, the U.S. government approved $750 million USD for the Alliance for Prosperity (AfP) for the Northern Triangle countries – Honduras being one. Despite widespread and well-documented violations of basic human rights, rampant impunity, total lack of confidence in the judiciary and state security forces, the U.S. has simply continued its decades-long policy of imperialism, neoliberalism, and militarization in Honduras. The only thing that has changed with the U.S.’s support this year is the plan’s name. As the Honduras-based Coordinator for the Honduras Solidarity Network (HSN), your financial contributions support the work that I do with Honduran communities and organizations in resistance to the unjust neoliberal economic model and U.S. and Canadian foreign policy. 2016 has been an extremely difficult year for the Honduran movement and their allies like the HSN and other international groups. For me, 2016 will be remembered as the year that indigenous activist Berta Caceres was assassinated in her home. Berta provided endless guidance to activists like myself and she was one of the most exceptional Honduran political analysts and movement leaders in the region. She is greatly missed. Berta is just one of many activists that have been killed in Honduras since the 2009 military coup. What made 2016 different from previous years is how daring the Honduran government has gotten in targeting critics of its neoliberal policies and enhanced its fear and terror campaigns against those who resist. Unfortunately, we expect 2017 to be very similar. International solidarity allies should not shy away from Honduras or feel discouraged – this is the moment when solidarity is needed the most! But at this very moment of great need, my funding is running out! By March 2017, the gift that has enabled me to be the Honduras Solidarity Network’s hands, eyes, and voice on the ground will run out. It is only through the tax-deductible support of people such as yourself that my position will continue beyond March. · Coordinated or assisted in the coordination of six educational delegations of U.S. and Canadian citizens to Honduras. · Provided information, interviews, and/or contextual analysis to various international media including The Guardian, Outsider Magazine, the New Yorker, the Toronto Star, amongst many others. · Conducted research upon request for various grassroots Honduran organizations including COPINH, OFRANEH, Azacualpa Environmental Committee, the Siria Valley Environmental Committee, amongst others. · Provided on-going physical accompaniment and meticulous casework including asylum cases and migration detention cases in the U.S.; U.S. drug war cases including the massacre of four indigenous Miskito in Ahuas in May 2012; Canadian investors in neoliberal tourist projects on Garifuna land in Trujillo Bay, amongst others. · Mobilized the HSN’s emergency human rights alerts when the life or freedom of Honduran human rights activists were in danger; provided a monthly update for the HSN’s monthly membership call, and participated in determining HSN’s program and priorities. PLEASE SUPPORT MY WORK AS PART OF THE HSN’S SOLIDARITY WITH THE HONDURAN SOCIAL MOVEMENT. THANK YOU. A new blog and Facebook page appeared recently calling itself “Defensores de Honduras” (Defenders of Honduras), which, on November 14th, published distortions and misinformation in an attempt to discredit our network and our coordinator in Honduras, Karen Spring. We deplore these attacks and condemn the fact that they are a provocation that increases the risk to persons already at risk for their work in defense of human rights. We consider the attacks from “Defenders of Honduras” to be the latest in an orchestrated campaign of psychological warfare to confuse and destroy the social and political movements opposed to authoritarianism and militarization and to isolate them from international support. We recognize this scenario. It is the same script written by the US State Department and US intelligence agencies and used in the 1954 overthrow of Guatemalan President Jacobo Arbenz, in the Central American conflicts of the 1980’s and in Colombia to the present day. It is a scenario to justify and incite violence and conflict and to create “false positives” and call them extremists. This is about government-backed impunity and an effort to destroy the social fabric of the movements in the Aguan. The very use of the term “extremist ideas” reveals that this is not really about the crimes of narcos in the Aguan. Since the 2013 elections and even more since President Hernandez took office, a plethora of social media accounts with similar phrasing and messages and false accusations have appeared attacking Honduran journalists, social movement leaders, and human rights defenders, both national and international. The accusations echo statements made by President Hernández and his administration’s officials, which claim that in defending human, civil and territorial rights, these people are defaming the country, organizing violence, or more recently that they are linked to organized crime. Meanwhile, international solidarity and human rights activists are accused of being “aligned with the extremist ideas” of those Honduran defenders and activists. In fact, it is the Hernández administration and Honduran security forces who organize violence against the social movements and anyone who dares to publicize or advocate for their cause. The HSN is not neutral, but we are truthful. The truth is that we stand with the Honduran people and with their organized social movements. We defend human and civil rights within the framework of recognized international standards, and we work to end our governments’ support for the violent authoritarianism and neoliberalism that is destroying Honduras. Un blog y página de Facebook recién aparecieron bajo el título “Defensores de Honduras,” lo cual ha publicado distorsiones y desinformación con la intención de desacreditar a nuestra red y nuestra coordinadora en Honduras, Karen Spring. Reprobamos estos ataques y denunciamos que son una provocación que aumenta el riesgo a personas ya bajo riesgo por sus labores en defensa de los derechos humanos. Consideramos que los ataques de “Defensores de Honduras” son la táctica más recién de una campaña orquestada de guerra sicológica para confundir y destruir los movimientos sociales y políticos que se oponen al autoritarismo y la militarización y aislarlos del apoyo internacional. Reconocemos este escenario. Es el mismo escenario utilizado por el Departamento del Estado de los EE.UU y sus agencias de inteligencia para derrocar el gobierno del Presidente Guatemalteco Jacobo Arbenz en 1954, en los conflictos de Centroamérica en la década de los 1980, y en Colombia hasta el día de hoy. Es un escenario utilizado para justificar y provocar violencia y conflicto y para crear “positivos falsos” y llamarlos extremistas. Esto se trata de la impunidad respaldada por el gobierno y de esfuerzos de destruir el tejido social de los movimientos en el Aguán. El uso mismo del término “ideas extremistas” revela que esto realmente no se trata de los crímenes de los narcos en el Aguán. Desde las elecciones del 2013 y aún más desde que el Presidente Hernandez ascendió a la presidencia, un montón de cuentas en las redes sociales con frases, mensajes y acusaciones falsas muy parecidas han aparecido para atacar a periodistas, líderes y lideresas de los movimientos sociales y defensoras y defensores de derechos humanos, tanto de Honduras como del exterior. Las acusaciones son un eco de las declaraciones hechas por el Presidente Hernández y los oficiales de su administración, las cuales afirman que al defender los derechos humanos, civiles y territoriales esta gente está difamando al país, organizando la violencia, o, más recién, que está vinculada con el crimen organizado. Mientras tanto, se les acusa a las y los activistas internacionales de derechos humanos y solidaridad de ser “alineada con las mismas ideas extremistas” de estos defensores y defensoras y activistas hondureñas. De hecho, es la administración del Presidente Hernández y las fuerzas de seguridad quienes organizan la violencia en contra de los movimientos sociales y cualquier persona que se atreve a amplificar o hacer incidencia por su causa. La HSN no es neutral, pero sí nos apegamos a la verdad. La verdad es que estamos con el pueblo hondureño y sus movimientos sociales organizados. Defendemos los derecho humanos y civiles dentro del marco de las normas internacionalmente reconocidas y trabajamos para acabar con el apoyo de nuestro gobierno a la combinación de autoritarismo y neoliberalismo violento que está destruyendo a Honduras. The Honduras Solidarity Network in North America denounces the assassination today, only a few hours before this writing, of Jose Angel Flores, President of the campesino organization MUCA (Unified Campesino Movement of the Aguan) and Silmer Dionosio George, another MUCA leader. The campesino activists were killed by gunmen as they left a meeting of MUCA members. 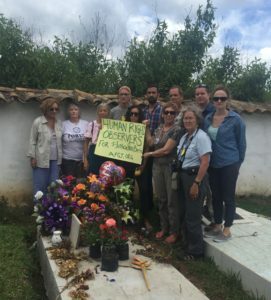 While we are still waiting for more information about the murders, we wish to emphasize that both men were recognized to be at risk by the Inter-American Human Rights Commission and were recipients of that organization’s precautionary measures making the Honduran government responsible for their safety. We are indignant that in the face of the ongoing and documented violence, repression and corruption involving the Honduran government, the US State Department has certified that it is satisfied that the Honduran government has taken effective steps to improve human rights. This inexplicable certification, given the situation in Honduras, clears the way for $55 million in U.S. aid. On October 9th there were two separate assassination attempts against leaders of COPINH. The General Coordinator, Tomás Gómez Membreño, was driving the organization’s vehicle when he was fired on by unknown persons. Earlier, before dawn on the same day a local COPINH leader Alexander García was asleep in his home with his wife and children when unknown persons opened fire on the house, riddling it with bullets. By sheer luck the victims escaped injury in both cases. These assaults occurred after all of the case files on the investigation of the March 2016 murder of COPINH’s leader Berta Caceres, were mysteriously stolen from a vehicle owned by a government judicial official on September 29th. The United Nations and the OAS anti-corruption entity in Honduras (MACCHI) have demanded an explanation and investigation from the Honduran government of why the files were not secured and how they were stolen. There has also been no follow on the reports of a “hit list” for political assassinations being implemented by a special group of the Honduran military. (1) We reiterate our support of the family of COPINH’s coordinator Berta Caceres Flores (assassinated on March 2, 2016) in their demands that all those responsible in any way for that murder be brought to justice and that the illegal Agua Zarca project be ended. October 3 – A protest of privatization of highways at the toll road booths near Tegucigalpa was attacked by National Police using quantities of tear gas. The peaceful protest included elected members of the political opposition in the national congress. On September 30 the minister of security, in a clear attempt to stop citizens from exercising the right to assemble and to protest, had publicly threatened repression for anyone planning to protest. Our network is also in receipt of numerous complaints for this same period of continued criminalization, intimidation and violence against small farmers, and indigenous communities and we also take note of the reports of the intimidation against journalists, lawyers and the political opposition. We condemn these actions and once again make the demand that the US stop funding and training Honduran security forces, and stop supporting the megaprojects and privatizations that are behind the Honduran government’s ruthless assaults on the people’s human and civil rights. Demand that your US Congressional Representatives support the Berta Caceres Human Rights in Honduras Act – HR5474. Since the 2009 coup, solidarity and human rights organizations in the US and in Honduras have worked to stop US funding violence in Honduras. On June 14, 2016, US Congressman Hank Johnson of Georgia introduced HR5474. This Act would cut off US funding and support for the repressive Honduran military and national police and end US support for funding of mega-projects against the wishes of the local population. As of September 25, 2016, 41 representatives have signed on in support. Please contact your congressional representatives and find out if they are supporting HR 5474.